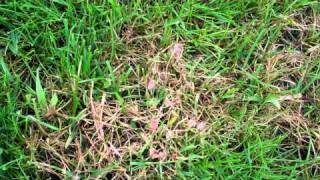 Red thread lawn disease (aka Pink Patch) is a grass fungus we are seeing quite a bit as me move into our summer season. Red thread is a fungal disease that is found in slow-growing, nitrogen-deficient turf grass such as bluegrasses, bentgrass, fescues, Bermuda grass and perennial ryegrass. The fungi are small, water-soaked spots that cover the leaf blade in a red or pink color. Don't water more than every 3 or 4 days per week. Only water in the early morning hours. Clean off your mower in between mowings...bag clippings for a while if Red Thread is severe. You may need to add a little nitrogen to help combat the fungus, though too much Nitrogen can lead to a sister fungal disease, brown patch. Seek professional advice on how much Nitrogen is the most beneficial. A post-fungicide may help, but can be quite costly and is only warranted in truly severe cases. Seek professional advice.